She conquered the beast - sea sickness. She armed herself with a patch and hope and we set out early in the day for South Plaza, a long thin island (about 13 hectares in size). We had been warned that the waters were rather rough. Mary was fearful, having never tried a patch nor dared to take a ride over ocean waves. Side effects looked freaky. 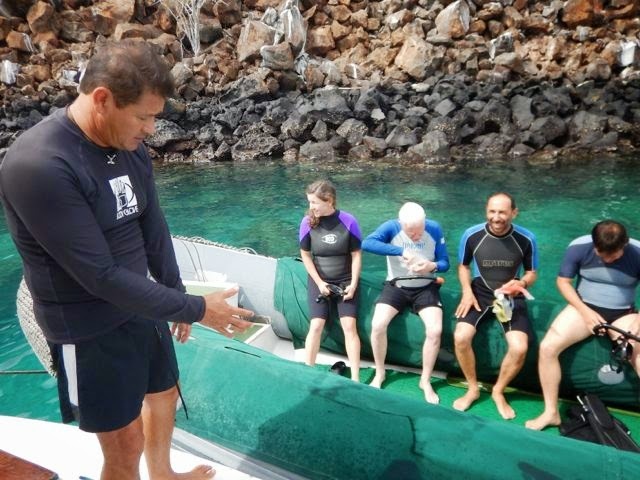 First, we joined on the boat a group of 9 Israelis who were on a snorkeling excursion all through Galapagos Islands. That part was a short 10 minutes to the diving area. Mary pulled on her wet suit and squeezed into her flippers and was rich there with them. Among the sea ware she encountered in the water underworld were white tipped reef sharks, probably a golden cowray, a Steamer Hogfish that has a big knot on his forehead, a swarm of large parana, a bright yellow pyramid sea star with points as long as her arm, and Damsel fish: black fish with yellow lips, a yellow fin and big blue eyes. She was full of joy when she returned to the deck. 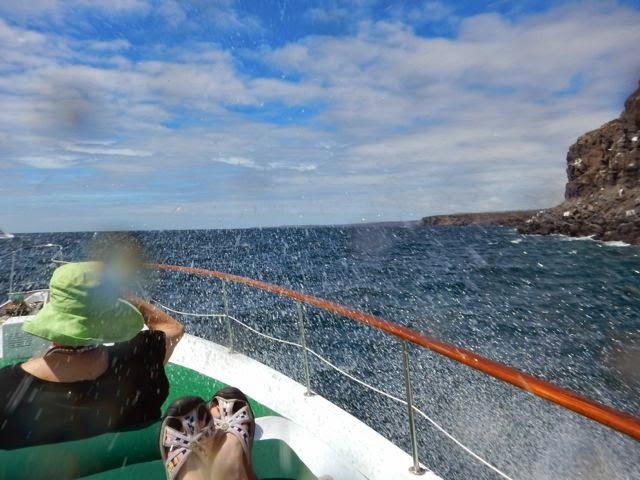 The snorkeling was in rather calm waters but soon we had to pass into the exceptionally rough sea. (none of this slightly rough as was described by tour guides.) 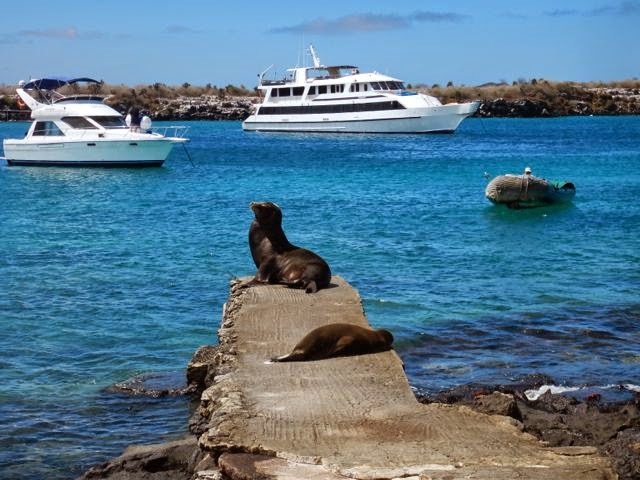 One of the reasons we were staying on Santa Cruz Island at the Galapagos Safari Camp is because Mary couldn’t commit to seven days on a cruise ship for fear of sea sickness. 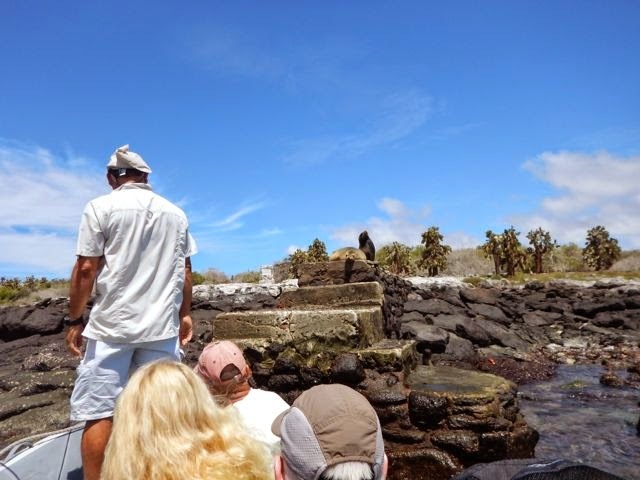 And this limited the places we could go to experience all the animals of Galapagos. The ships sail from island to island in the night while people sleep. 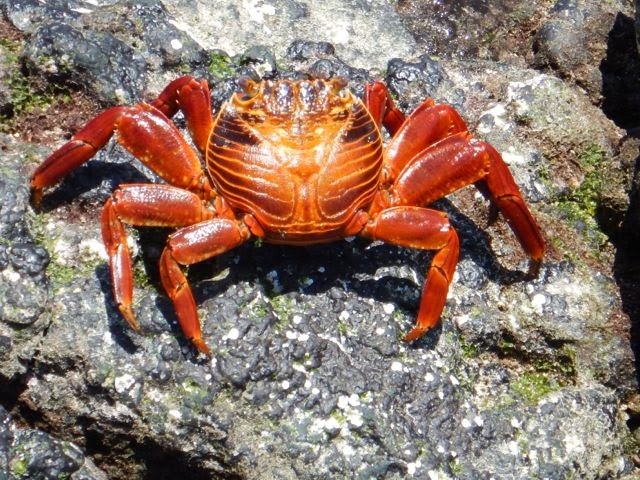 We were confined to short boat trips to areas close to Santa Cruz Island. sun and sea when Bam! we hit one huge wave, then another, and in the hitting, spray soaked us and it was all we could do to get back into the shelter area. Well, Mary drank ginger tea from the thermos the camp had provided and stood in the open door and watched the sea and the boat bounce and everyone swayed and tried to hold on or to stay balanced. And she endured and endured. After 45 minutes we hit the smooth water again right before the landing. We breathed a great sigh of relief. I was feeling the wooze a bit, but I was so proud of her. High Five. Now she could venture over water. 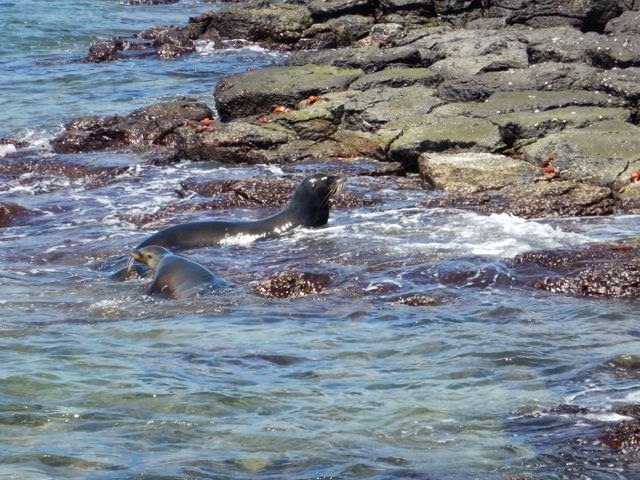 Everyone got into the dingy for a short five minute ride to something similar to a landing place, a narrow concrete jetty which was occupied by a couple of stubborn sea lions, soaking up the precious sun and very agitated that here came a load of tourist. Mario the guide borrowed a tourist’s walking stick to shoo them off the narrow block so we could disembark. And soon we walked into the world of Opunti cactus in various stages of growth and health, and shiny white rocks that look like marble and silver - but I was told the white was really sea lion poop, which is white because of the fish they eat and as they travel over the rocks again and again, the old white poop suddenly becomes glistening like a marble surface. 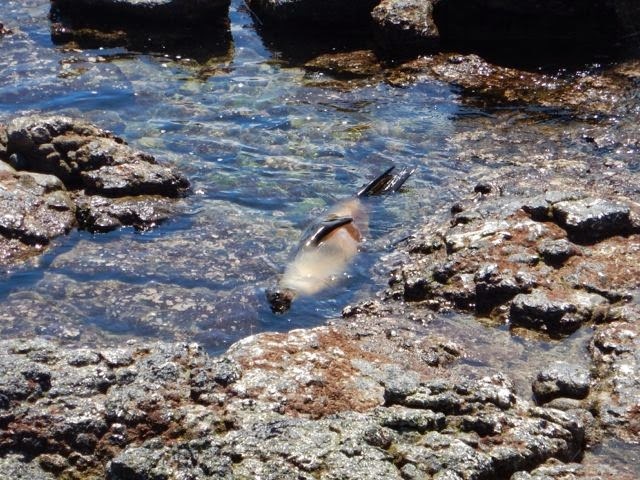 Sea lions pose like stars, mostly living the life in a pool of icy water or on a rock where the sun turns their skin golden. Sometimes I feel a bit of envy - What a life. it safe from all the paparazzi taking fotos and ooing and aahing. One wonders what fear we humans put in such beautiful birds. 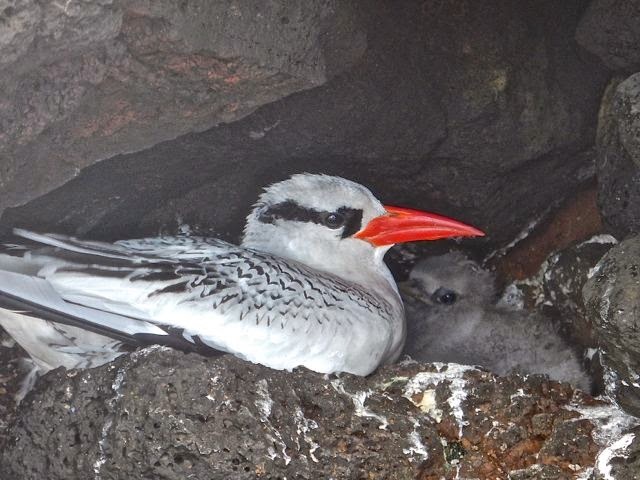 However in Galapagos, so far sea birds are not disturbed by the human footprint, it seems. There must have been an enormous school of fish in the large waves on the west side of South Plaza because swarms of redbilled tropic birds were diving to feast. As we picked our way to the end of the one mile oval hike, other boats of tourists were arriving. Tourism has multiplied too fast on these islands, since I was last here in 2007, but the government tries to control the numbers of visitors per day per hour per island. 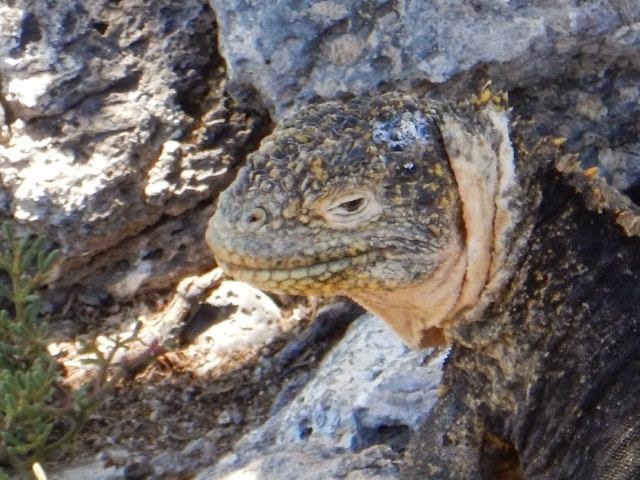 Are we disturbing the routines of the iguanas, the birds, the turtles, the boobies? 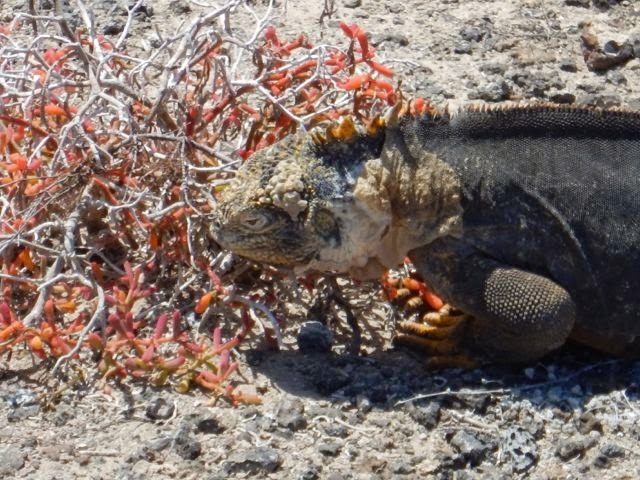 As much joy we derive from learning about them and actually seeing them close-up in their daily habits, what are we doing to this environmental miracle called Galapagos? Are we invading or preserving? Time will tell, I guess. The boat trip back was a contrast to the one over. Mary even ate a healthy lunch served to us visitors. 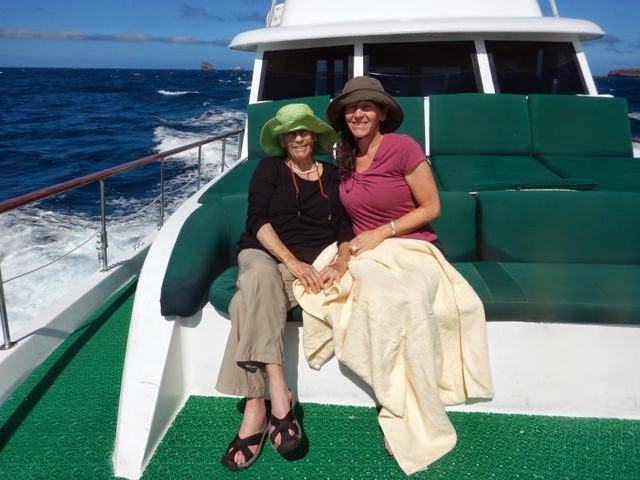 And we were able to sit out on the front of the boat on those green pillows and under a blue sky and hot sun rocking with the waves, but this time we went with the tide and therefore it was not rough. There may be a message there: go with the flow?